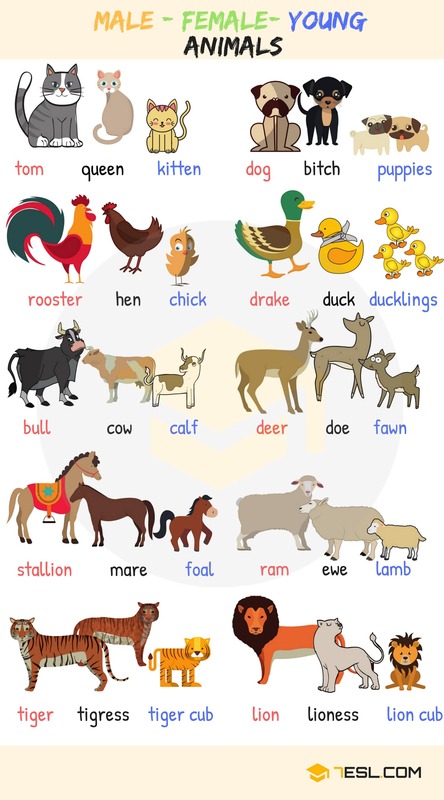 Learn Animals vocabulary in English through pictures and video to expand your vocabulary. Animals are multicellular eukaryotic organisms that form the biological kingdom Animalia. With few exceptions, animals consume organic material, breathe oxygen, are able to move, reproduce sexually, and grow from a hollow sphere of cells, the blastula, during embryonic development. Mammals are any vertebrates within the class Mammalia, a clade of endothermic amniotes distinguished from reptiles (including birds) by the possession of a neocortex (a region of the brain), hair, three middle ear bones and mammary glands. Females of all mammal species nurse their young with milk, secreted from the mammary glands. Insects are the largest group of animals on earth by far. They have many legs; and most have wings. Insects were the first animals capable of flight. As they develop from eggs, they undergo metamorphosis. Wild animals are animals that living or growing in the natural environment; not domesticated or cultivated. Farm and domestic animals may live on a working farm or they may be pets in someone’s backyard. Although farm animals are not your typical pet, they can be very affectionate and bond with their humans.